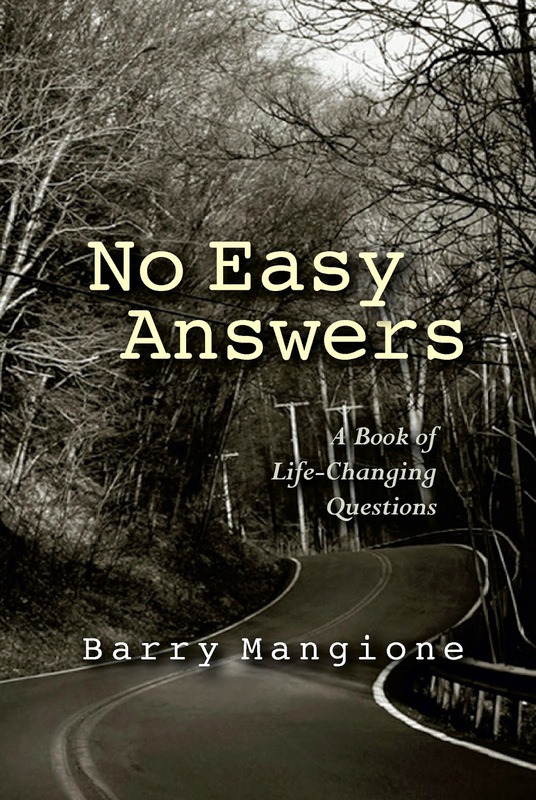 Today we're interviewing Barry Mangione, author of the self-help book No Easy Answers. I'm an author, musician, singer/songwriter, life coach, and pediatric physical therapist. Over the past several years, I've overcome depression, divorce, bankruptcy, alcoholism, and thoughts of suicide to become the happy, healthy, and hopeful person that I am today. Describe the purpose of No Easy Answers in a few sentences. Without self-awareness, there can be no self-help. In order to truly know yourself and be able to help yourself, you first have to ask yourself some hard questions. The purpose of this book is to share the questions that helped me transform my life in an effort to help and inspire others do the same. Each chapter is a question that I asked myself during my personal transformation, and the reader is encouraged to ask the same questions of themselves. Who do you think would most appreciate No Easy Answers? I think anyone who is in the process of changing their life for the better will appreciate this book. It's divided into three sections: recovery, redemption, and reinvention. If you can identify with any one of these stages of life's journey, there's something in No Easy Answers for you. What inspired you to write a book about your transformation from a struggling individual on the verge of suicide to a happy and successful person? I realized that I had a choice. I could either keep this knowledge and experience to myself, or I could share it with the world in the hopes that someone else going through similar struggles would find hope, inspiration, and the individual empowerment to overcome their personal adversity. During the period of your most difficult challenges, what motivated you to strive to be a better person? My love for my children motivated me to keep going, and a burning desire to express myself through music and writing. If I did not have music and writing as a creative outlet during those times, I'm not sure where I would be today. My hope is that people will ask themselves the same questions that I ask myself in the book, and that the process of answering those questions for themselves will lead them down a path of greater self-awareness and inspire them to do great things. I hope people will come back to the questions in No Easy Answers throughout the difficult times in their lives for guidance and wisdom. My next project is tentatively titled, Weapons of Hope. The idea is to further explore all the concepts, ideas, and practices that kept hope alive for me during the darkest of times and that still motivate me to strive for more today. Rather than using the framework of questions as I did in No Easy Answers, I'm using the framework of weapons to view hope not as something you wish for, but as something you fight for. A portion of the profits from sales of No Easy Answers will be donated to Appalachia Service Project, a nonprofit organization with which I'm personally involved. Their mission is to make homes in the poorest regions of Appalachia warmer, safer, and drier for the people who live there. I talk about some of my experiences with Appalachia Service Project in the book.